It's a new month and time to recap last month's #GoalGetter2013 progress! I hope you are all getting after those goals you set back in January! Now for the month of June! Run at least one mile every day for the Runner's World Run Streak: Boom! I crushed this goal this month! I even ran while on vacation! As of today, I have been streaking for 37 days! Daily Bible Devotion Goal: I've done pretty good with this thanks to She Reads Truth! I've done two bible studies this month...1 Peter and 2 Peter! Stretch and Roll Daily Goal: Yes! Since I've been running every day this has been easy. Stretching and rolling are part of my run routine so it was easy to crush this goal this month! 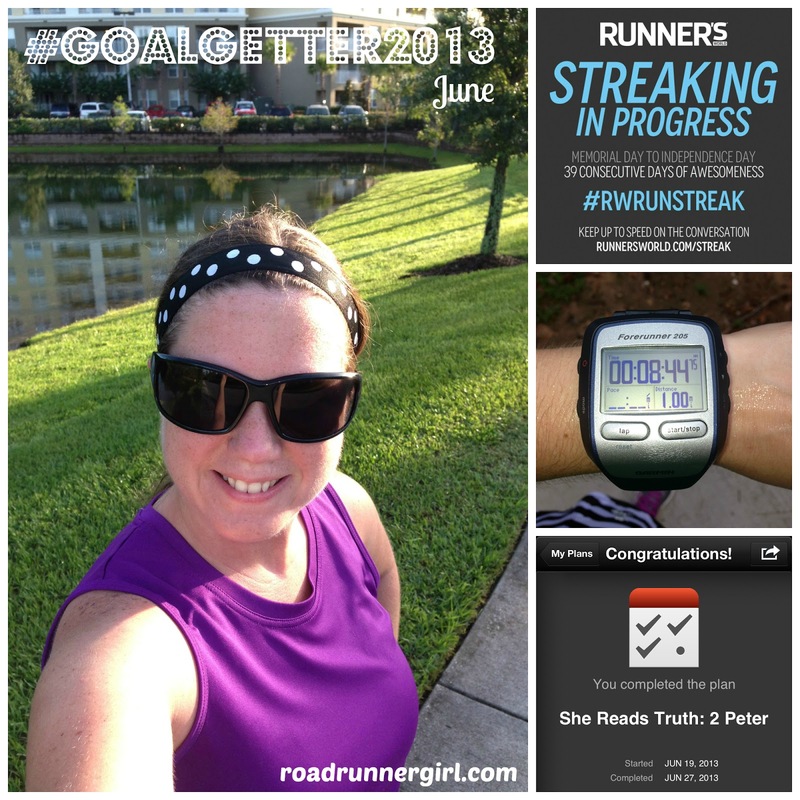 Per #GoalGetter2013 requirements, I posted the following picture on Instagram to show my goal progress for June! For the month of July, I am focusing on running at least 3 times a week and keeping up my mileage. I will start half marathon training in August so I want to be strong and ready! I'm also focusing on cross training. My goal is to incorporate at least one walk in every week..gotta start somewhere right? As I've talked about in my Weekly Chase posts, I want to continue to read my Bible daily. I also want to continue to stretch and roll daily. QOTD: What goal did you crush in June?